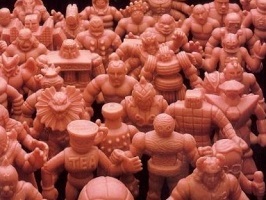 Welcome to the University of M.U.S.C.L.E.! This is not the final version. I still have a lot of information to post, and most of it is being held up by the need to take pictures. But thanks to Nathan Newell I finally have a site that I can both manage and update. Two of the things I think collectors will especially enjoy, in the hopefully not-too-distant-future, are a printable Figure Guide explaining the rarity of each figure plus as well-photographed archive of all the color MUSCLE figures. The guide and rankings have been proofed by several MUSCLE experts. It was a group project that will find its home here and hopefully with collectors. I simply need to finish the pictures and final formatting. I hope everyone will enjoy the site! With the site map not quite ready, here’s a link to give you an idea of what is ready and coming up. This entry was posted on Thursday, June 18th, 2009 and is filed under UofM News. You can follow any responses to this entry through RSS 2.0. Both comments and pings are currently closed.